Bokashi composting makes it possible for people with limited outside space to make high quality homemade compost from their food waste. From talking to our customers, we know that there are a large number of you who use the soil factory method to bury your pre-compost. Here, we will look at a slight variation on this; burying your bokashi pre-compost directly into a planter or container. This is something that I have been doing in my backyard for a number of years with great success. 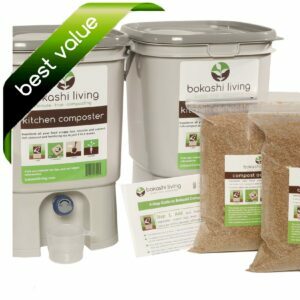 By adding bokashi pre-compost to your containers you are adding great nutrients and organic matter which will help with plant growth and water retention. In my sun trap of a garden I used to lose many plants if I forgot to water for a day. 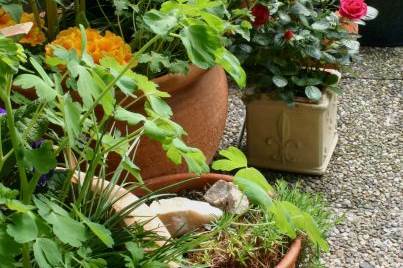 Since adding bokashi pre-compost each year to my containers I have noticed much better water retention. Forgetting to water my containers for a day or two no longer results in parched, dead plants. Any planter will work for this as long as it has drain holes. Personally I think the larger the container the better; larger containers tend to dry out more slowly! Firstly add a layer of good garden soil. Fill the container approx 1/3 full. Ideally you want soil with lots of life in it; worms, bugs, creepy crawlies etc. If you only have access to potting compost then try to add a few handfuls of good garden soil too (ask a neighbor or local community garden). The more life you have in your soil the quicker the pre-compost will break down. Next, add a layer of bokashi pre-compost. Again, you want to fill your container by approximately a third. Mix the bokashi pre-compost well with the soil layer below. Make sure to break up any lumps of bokashi pre-compost. The final stage of the bokashi composting process will work faster when mixed thoroughly with the surrounding soil. Fill the container with more garden soil. Again, you can use shop-bought compost but expect the pre-compost to take slightly longer to break down as there are significantly fewer biota in bagged compost than garden soil. 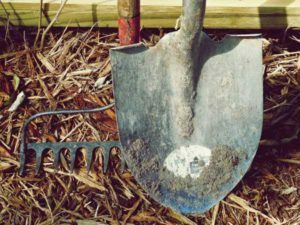 The pre-compost will sink slightly, therefore mound the final layer of garden soil. Add extra garden worms, if available! Cover the container with a large plastic bag or lid to prevent from getting wet. Alternatively, move the container to a dry area. Excessive rain and water may cause the bokashi pre-compost to rot and putrefy. Leave the container for at least 2 weeks (ideally up to 4 weeks, if possible). You may see white mold on the surface. This is the fungi from the bokashi microbes; the same as you may see on the top of your bokashi bucket. After 2-4 weeks you are ready to plant. Mix the soil in the container. If you see lumps of bokashi pre-compost then you need to leave it for a few days longer for the soil biota to finish breaking down the pre-compost. You can now add your plants directly to the container; no need to add further fertilizer. Sit back and enjoy the fruits of your labor.